We have documented an interesting print restoration so you can see the steps involved in de-acidifying, cleaning and preserving a 130+ year old lithograph. 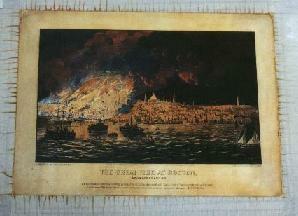 The print was in bad shape and we determined it was a great candidate for this restoration example. 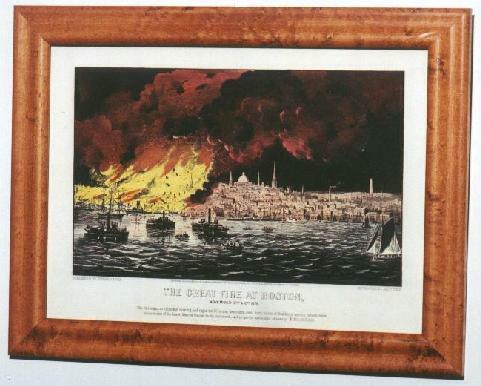 This copy of "The Great Fire at Boston. 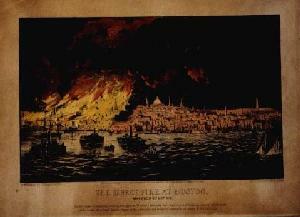 ", a popular Currier & Ives Litho, was darkened severely with age. 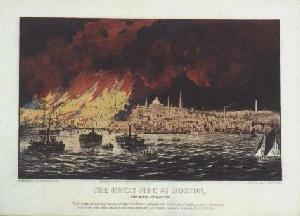 The brilliant reds used to depict the fire appeared almost brown on the print. Particular attention was paid to the red areas, as red is a very fragile color and could have been easily damaged during the lightening process. All work on this print was performed by George Cohenour, a noted historical print collector/dealer/conservationist. A link to George's web site can be found on our Links Page . This litho was cleaned using a gas lightening process. After the lightening was completed, the paper was de-acidified then alklized to prevent future acidification. The print was then dryed on a vacuum table. After drying and flattening, it was returned to the gas chamber for a final lightening. You can see the actual steps in this process in detail below. After the print restoration came the framing. 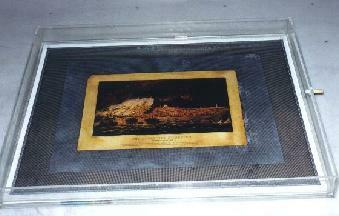 The print was placed in a historically correct Birds Eye Maple frame with conservation (UV reduction) glass. The framing was also done by George Cohenour. The Great Fire print gets a surface cleaning. 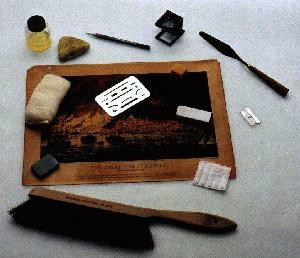 This picture shows some of the tools used to remove surface dirt (including fly debris) from the print prior to the lightening and stabilization process. Even though the print still seems very dark, all of the surface dirt has been removed and the print is ready to move onto the next step, the gas lightening. The picture on the left shows the gear needed to create the gas that will be used to lighten the print. 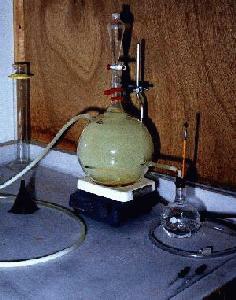 The gas is yellowish in color and it is pushed through the tubing into the gas chamber. The small flask is filled with water and the air is pushed through to create bubbles which show how fast the gas is entering the gas chamber. 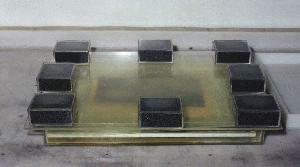 After the print leaves the gas chamber it gets deacidified by placing it into a bath. Because of the red, it is decided to float the print. You can see it is laying on a screen and a piece of Remay (type of cloth). At this point the paper absorbs the solution which, over time, neutralizes the acidic content. While this is going on, the process leaches out some of the impurities from the paper. After the de-acidification is complete, the print goes through the process of alkalization. This places a buffering compound into the paper to raise the PH which prevents it from becoming acidic in the future. From the bath, the print is placed on a vacuum table masked up to the print with paper, and the remaining dirt and impurities are pulled from the paper (you can see dark lines coming from the edges of print onto the underlayment). After drying the print, it is returned to the gas chamber to reduce any additional staining which was not removed by the bath and vacuum table. As you can see, the gas lightening process has returned this badly darkened print to a nearly pristine condition. In addition to the asthetic value of a cleaned print, the paper has been stabilized and preserved so that future generations can see and enjoy this fragile piece of Americana. Please make sure you visit George Cohenour's web site, a link to it is supplied on our Links page. All text and images � The Currier & Ives Foundation. Reproduction in whole or in part, is forbidden without prior written approval by an officer of the Currier & Ives Foundation.